Guttering plays a crucial role for any property. After your roof has kept out the rain, your gutters direct it away from your walls and foundations. While effective guttering often goes unnoticed, you’ll certainly know about it if your guttering doesn’t do its job. With that in mind, it’s important to have an effective guttering system in place and keep your gutters in tip-top condition. Rainwater is essential to keep our crops growing and reservoirs full. But there are some places you don’t want it to get to. The foundations of your home are one such place. Excessive water can put pressure on your home’s foundations, causing cracks and gaps to develop. First and foremost, this will allow rainwater into your home’s cellar/sub floor areas, which could easily become flooded. Over time, it could even develop and cause walls to push inwards, which would require serious foundation work to rectify. It’s not just foundations though. Gutters are also there to stop water streaming down the side walls of your home. Prolonged exposure to water can weaken your walls as well as staining them and causing heavy penetrating damp, which is why it’s so important to avoid. On top of that, it can make its way inside your home through open doors or breaks in the door’s sealing. Without effective guttering, rainwater can also cause damage to the area surrounding your home. Running off the roof, water can become concentrated in some areas of your garden or walkways and create unlevel surfaces. As well as ruining the appearance of your property, these dips or holes pose a serious safety risk. The first thing to check with gutters is the flow of water. Gutters are there to direct water away from your property regardless of how heavy it’s raining. Check around your property for any areas where water is overflowing. After rainfall, look out for water pooling around your property. If this is close to your foundations, it could spell danger. However, pools of water anywhere around your property usually indicates that your gutters have something wrong with them. Even if you can’t spot any specific overflows or pools, it’s possible to detect guttering problems by looking for discolouration on your walls. This usually indicates water damage on your walls or fixtures – like windows and doors – which is typically down to water leaking from gutters. It will only become worse as time goes on. Next on the list is the structural integrity of your gutters. Understandably, they need to be strong, slight fall (slope) and water-tight all the way around your property to do their job effectively. Cracks are one problem that interferes with this as they let water seep out of the guttering. Like a vicious circle, these cracks could become bigger the more water flows through them. They could even lead to parts of the guttering breaking off. In any case, the water flowing out is an immediate threat to your property. Sagging or bowing is a more serious structural defect to look for on gutters. This is when gutters visibly sag in parts, allowing water or debris to build up. It puts added pressure on the gutters which can cause them to break or even pull away from the wall. The latter is a huge problem, so it’s best to get it sorted quickly. Finally, there are some tell-tale signs of gutter wear and leaking which could help you identify problems early on. Mould is one such sign, which indicates that moisture is getting in undesirable places. Look around your gutters and pipes, around the top of your property and finally around the base to see if any mould is developing. Check the paint on your gutters too. Paint provides an extra protective layer for guttering, preventing water damage as it flows through. If you spot any flaking paint, it could spell danger for your gutters. Water and dirt could penetrate them and lead to cracks and breaks over time. Another problem which can arise from breaks in the paint protection is rust if your gutters are made of steel/cast iron. As water continues to penetrate your gutters, they will rust and become weak. Eventually, they will erode away, crack and break, allowing water to leak through and damage your property. As well as regular inspections, you can keep your gutters working well by preventing clogging. Clogged gutters are a problem faced by most property owners, which can occur naturally as leaves and other debris get trapped. When the rain falls on them, they become dense and heavy, holding moisture in your gutters and adding unnecessary extra pressure. If they aren’t cleared, they can cause water to overflow as well as damaging the gutters themselves. Trim trees – Where possible, keep trees trimmed so they don’t stretch over your property. Anything within close proximity of your roof will be a nightmare come autumn, when leaves fall directly into your guttering. Leaf guards – Some leaf guards are an effective solution to stop debris drifting into your gutters. However, it’s worth getting expert advice before installing them, as some types could make the problem worse. Regular clearing – The best way to keep gutters free of debris is to have them professionally cleared. Especially in autumn, this will stop debris building up, keep the water flowing freely and prevent any costlier problems arising. A completely new guttering system for your home will typically cost around £400-800. But it depends on a number of factors. Firstly, what condition are your fascias in? This is the edge of the roof, which carries the gutter. If it’s in a poor condition it will need replacing as part of the job, which will increase the cost. Naturally, the size and type of property affects the cost. Terraced houses don’t need as much guttering because they have fewer external walls, while detached homes will need guttering around their whole perimeter. Access also has a role to play in the price of your guttering. 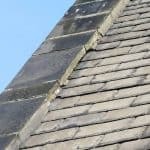 If there are parts of your home which are difficult to access, or your roof is significantly higher than most homes, then it could increase the price of the job. However, one thing to remember is that the cost of new guttering will be far less than the cost of fixing other problems further down the line if you don’t fix your gutters. Regardless of the size of your home, or any access problems, it’s easier and more cost-effective to replace your gutters than wait until you need serious structural work. Looking to keep your gutters working well with a health check, some repairs or a full replacement? Speak to the team at DPR Roofing in Leeds. We are experts in roofing and guttering, both domestic and commercial. With a detailed inspection and quote from us, you’ll know exactly what is wrong with your gutters and how we plan to put it right. We also provide regular gutter cleaning at very reasonable costs, so you don’t need to worry about debris clogging things up.